Perched on Victoria’s southwest corner due north across the Strait of Juan de Fuca from Port Angeles, WA, James Bay is North America’s oldest West Coast neighbourhood north of San Francisco. And by the look of things, it has an ant problem! Fortunately there’s a giant anteater (Myrmecophaga tridactyla) on the loose in Victoria. After sniffing out its quarry, an anteater uses its sharp front claws to tear into anthills and then feasts by flicking its tongue up to 160 times a minute. Sometimes called an “ant bear,” the giant anteater is quite common in Los Llanos (Venezuela’s tropical grasslands). How this one found its way to Victoria is anybody’s guess. NB • The image here varies slightly from the actual ride as I used Photoshop to remedy two minor glitches caused by two wrong turns – one at the base of the tail, the other at the top of the rear left leg. 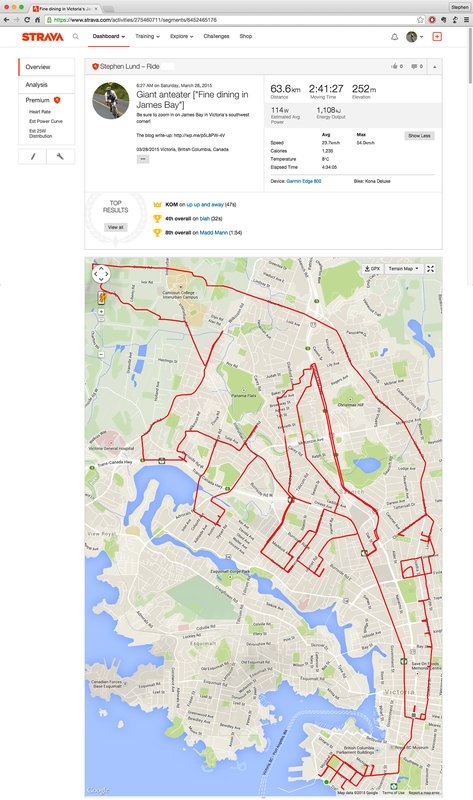 This entry was posted in gps art and tagged animals, bicycling, creativity, cycling, garmin, giant anteater, gps, gps art, strava, strava art, victoria bc. Bookmark the permalink.